Indeed, tiny, pristine Bermuda, a fishhook-shaped island 750 miles east of New York City, is blessed with an abundance of charms. It has the turquoise waters, blissful beaches and tropical flavours you’d find in the Caribbean, but without the rough edges. Contrary to popular opinion, it’s not part of the Caribbean. 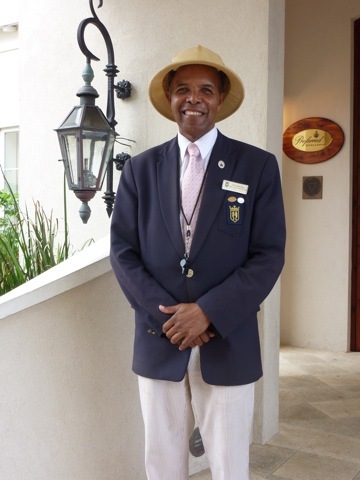 Bermuda is clean, orderly and polite with a proper British accent and a distinctive style. 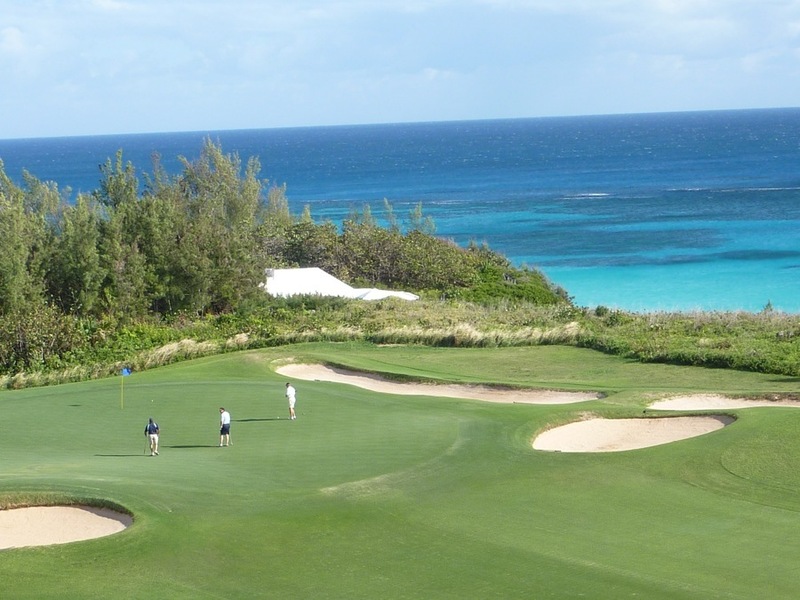 Just a two-and-a-half-hour direct flight from Toronto, it’s the ideal golf getaway for what the locals (known as onions) have coined a “Bermudaful” long weekend. Bermuda began with a shipwreck in 1609 off the coast of the east end of the island where St. George’s, the original quaint capital, is located. Admiral Sir George Somers and the crew of the Sea Venture, en route to start a British colony in Virginia, foundered on one of the many reefs, came ashore and settled. Some speculate that William Shakespeare based The Tempest on this happenstance. Once declared a British colony, settlers began arriving in 1612. Just ten minutes from the airport, overlooking Castle Harbour, Tucker’s Point Hotel & Spa, a stylish boutique resort that opened last April, makes the ideal luxurious base for avid players. Guests can use the hotel shuttle to play both Tucker’s Point and neighbouring Mid Ocean. Both are exclusive, private clubs but open to island guests on Mondays, Wednesdays and Fridays. Advanced bookings are advisable and caddies are available. Framed by crystal blue water at almost every turn, Tucker’s Point was originally mapped out in 1932 and then revamped in 2002 by architect Roger Rulewich. 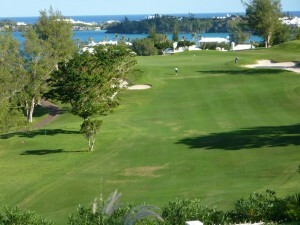 Huge elevation changes are a feature on all three of Bermuda’s top layouts. On the par-four twelfth at Tucker’s, take advantage of gravity as you hit your blind tee shot from elevated tees far down to a green that sits over a pretty cove. 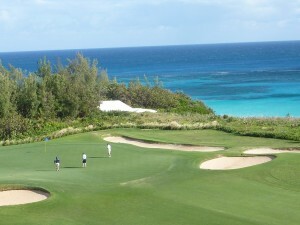 Charles Blair Macdonald originally laid out the formidable Mid Ocean Club in 1921.Robert Trent Jones tweaked it in the 1950s. The opening and finishing holes perch on cliffs overlooking the Atlantic, while the rest of the routing meanders along rolling terrain highlighted by exceptional bunkering and impeccable greens. Flat lies are few and far between.Tread Mid Ocean’s fairways and you’ll be following in the footsteps of the likes of Sir Winston Churchill, The Duke of Windsor and Babe Ruth, to name a few. I wonder if they had as much trouble as I did on the signature number five, a veritable ball magnet of a hole that plays over and around Mangrove Lake. Surprisingly, the Port Royal Golf Course, a public facility, may be the crown jewel of the Bermuda’s golf offerings and certainly the island’s best value. The Robert Trent Jones design re-opened in 2009 after a $14.5 million renovation and hosted the PGA Grand Slam of Golf in 2009 and 2010.Port Royal ranks among the best public courses in the world. Several holes provide marvellous sea vistas but number sixteen is a true drama queen—a par-three set across the ocean cliffs on its own snug peninsula. Be prepared to make an ocean offering to Neptune. 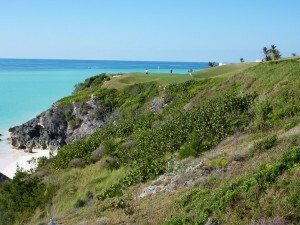 The entire 6,842 yards (the longest course on the island) will both challenge and seduce. After fifty-four greens, I indulged in some re-hydration and relaxation at the Spa at Tucker’s Point. 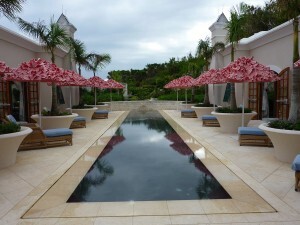 The facility incorporates many of the island’s tropical plants and gifts from the sea into unique therapies using lavender, lilies, citrus fruits, marine extracts and even a dash of rum in its “Swizzle” manicures and pedicures. Their Bermuda Collection is a three-step treatment starting with a honey and sugar cane scrub—the former harvested from the resort’s own property—and followed by an invigorating shower with eighteen massage heads. The grand finale is a full body massage using a silky balm of indigenous aloe, lavender and coriander. The Spa’s walled reflecting pool area is the ideal place to enjoy a cup of tea and chill out after your treatment. Wahoo, chowder and rum punch! When it’s time to make dining reservations, you’ll be spoiled for choice. Most chefs have their own “secret” recipe for Bermuda fish chowder—a slow-simmering soup made with fish stock, onions, potatoes, carrots, tomatoes, celery, bay leaves, more spices and a liberal dash of rum. Traditionally, the chowder is served at the table with bottles of Outerbridge’s Original Sherry Peppers sauce and black rum so you can spice it up to your liking. I enjoyed one of the best chowders at the new 64˚ Bar & Grill in the Port Royal clubhouse. Bermuda’s other Piscean specialties include red, grey and yellowtail snapper, rockfish and wahoo—a game fish from the mackerel family. The island has no lack of stellar chefs. Jean-Claude Garzia at the helm of Beau Rivage restaurant at the Newstead Belmont Hills Hotel was awarded the Meilleur Ourvier de France in 1997, France’s most coveted culinary honour.Garzia excels at putting a local spin on classic French dishes. His velvety lobster bisque uses the island’s spiny crustaceans and his version of tarte tatin is made with fruit from the local loquat tree. Garzia’s beef Wellington is pure perfection wrapped in flaky pastry. The restaurant’s floor-to-ceiling windows afford enchanting views of the twinkling lights of Hamilton Harbour. On my last evening I sampled Tucker’s Point’s signature cocktail, the Hibiscus Bliss (a bubbly concoction of Champagne poured over a hibiscus flower preserved in wild hibiscus syrup) before tucking into some of Executive Chef Serge Bottelli’s brilliant cuisine, which he describes as “haute Mediterranean with a Bermuda influence.” I recommend the grilled vegetable and truffle terrine followed by the porcini-crusted sea bass. Bottelli recently introduced entrées in two sizes so those wishing to dine lighter can do so. But whatever you choose, be sure to save room for Bottelli’s frozen spiced chocolate soufflé and a nightcap of Bermuda’s national libation, the Dark ’n Stormy. The cocktail began in the ginger beer factory that was run as a subsidiary of the Royal Naval Officer’s Club. The sailors soon discovered that a splash of Gosling’s Black Seal rum and a slice of lime greatly enhanced the ginger beer. The name is said to have originated when one old salt observed that the drink was “the colour of a cloud only a fool or dead man would sail under.” Anyway, it’s a fitting drink for an island that got its start due to a shipwreck.